A court in Argentina has granted house arrest to an 88-year-old former police officer who was serving a life sentence for crimes against humanity. Miguel Etchecolatz headed police investigations in Buenos Aires province from 1976 to late 1977, when Argentina was ruled by a military junta. Etchecolatz confessed to killing political opponents under military rule although he never said how many. 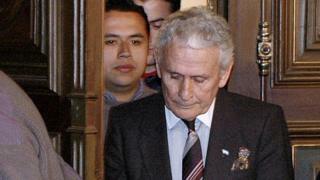 He was also found guilty of stealing the baby of two Uruguayan militants. The court ruled that because of his "fragile health" Etchecolatz should be transferred from prison to house arrest, where his wife will be allowed to care for him. He will be required to wear an electronic monitoring device. The decision to grant Etchecolatz house arrest has caused anger among human rights activists in Argentina, who called for street protests. Etchecolatz's own daughter, Mariana, earlier this year gave an interview to the magazine Anfibia, in which she said she hoped her father would remain in jail for the rest of his life. She described him as an "evil narcissist without scruples". The 47-year-old said that she had changed her surname as she did not want anything to do with her father, whom she described as "cold, like a robot". During his time as chief of police investigations, Etchecolatz ran 21 clandestine detention centres where inmates where tortured and forcibly disappeared or killed. He was also in charge during the "Night of the Pencils", when 10 students were abducted by security forces in the city of La Plata near Buenos Aires in September 1976. Six of the 10 were forcibly disappeared, their fate is still unknown. The four survivors said they were horribly tortured. Etchecolatz was sentenced to 23 years in jail in 1986 for his role in the "Night of the Pencils" and other crimes but he was released under a subsequent amnesty law. Following this release, he wrote a book giving his version of events. In it, he showed no remorse. "I never had, or thought to have, or was haunted by, any sense of blame. For having killed? I was the executor of a law made by man. I was the keeper of divine precepts. And I would do it again," he wrote. In 2004, he and police doctor Jorge Bergés became the first to be sentenced for the theft of a baby during Argentina's military rule. The were found guilty of arranging the theft of Carmen Gallo Sanz, a baby girl born in 1977 to two Uruguayan opposition activists in a clandestine detention centre. Her parents were never seen again and are among the 30,000 people killed or disappeared under the years of military rule from 1976 to 1983. Ms Gallo Sanz, who had been issued with a fake birth certificate by Bergés, only found out about her identity in 1999. News of Etchezolatz's transfer from prison came on the same days as an announcement by the campaign group Grandmothers of the Plaza de Mayo that they had identified another of the babies stolen during military rule. At a news conference, the group said that DNA tests had confirmed the identity of the daughter of Carlos Poblete and María del Carmen Moyano, two activists who were forcibly disappeared in 1977. The daughter did not attend the news conference and a member of the campaign group said she hoped that the woman would agree to meet her biological aunt, who had been searching for her for 40 years.